A gorgeous and delicious cookie with a nutritional benefit. Each cookie is one-half whole grain and contains the antioxidant Vitamin E.
Nutrition Highlights: Every cookie is one-half whole grain from the white whole wheat flour. Almond meal adds antioxidant Vitamin E to these decadent and delicious butter-rich treats. Whisk together three flours in medium bowl and set aside. Combine butter and sugar in large bowl of electric mixer with paddle attachment. Beat at medium speed, scraping bowl often, until creamy. Mix in almond extract and lemon and orange zests. Reduce speed to low and add flour mixture slowly, mixing well after each addition. Place dough on large piece of plastic wrap, form into slightly flattened disk and completely cover with wrap. Refrigerate at least one hour. Shape dough into 1 to 1-1/4-inch balls. Place 2 inches apart on ungreased cookie sheet. Make deep indentation in center of each ball with thumb. Edges may crack slightly, but that’s okay. Fill each indentation with at least ¼ teaspoon preserves or jam. Bake for 14 to 15 minutes or until edges are lightly browned. Let stand one minute on cookie sheet then remove to wire cooling racks. Once cooled, store in tightly covered container in single layer. Nutrition Facts per Serving: Calories – 83, Total Fat – 4.7g, Sodium – 31mg, Total Carbohydrates – 9.6g, Protein – .8g **Nutrition information is calculated using an online calorie calculator. Variations may exist. Values are based on a 2,000 calorie diet. Change up the flavors! Replace the suggested jams with your favorites. Any fruit-flavored jam or preserves is delicious. I tried this recipe a few days ago and it was incredible! Shortbread cookies were always one of my favorites as a kid and if I’d known they were this easy to make, I would have started when I was a pup. I just made these cookies tonight, and they are delicious! I substituted half of the butter with non-hydrogenated shortening and about a tablespoon of olive oil, and they turned out really well! 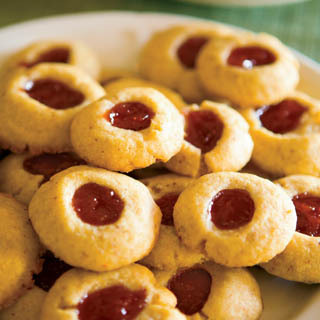 I love thumbprints, but have never made them with almond flour. Sounds wonderful! Thanks for sharing on Foodie Friends Friday!